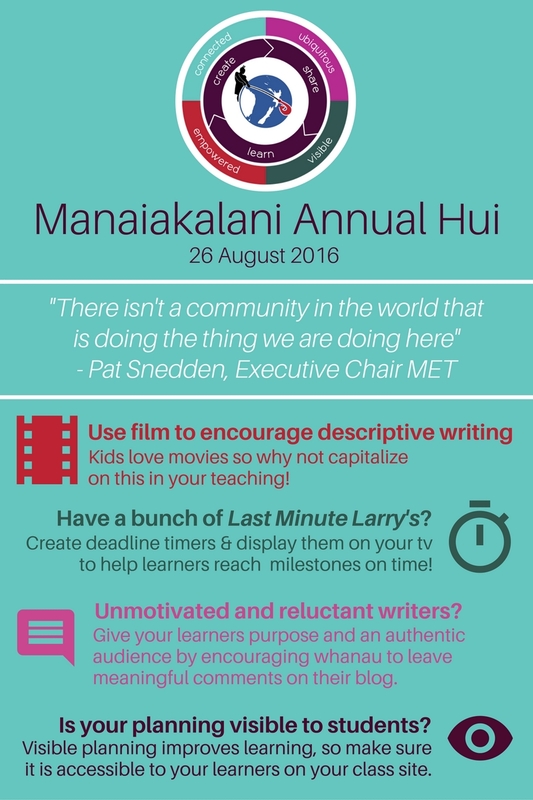 On Friday the MDTA were very lucky to attend Manaiakalani's 5th annual Hui - a place where teachers and learners across Manaiakalani celebrate and share their accomplishments. 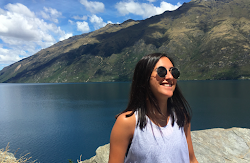 This has ended up being a rather lengthy post, as I gained many new insights from the teachers, researchers and learners at the hui. First up we heard our Manaiakalani student ambassadors share their learning. It was really interesting to hear from students how they learnt in their school. What I like about Manaiakalani is that every school is different. Although we are all following Manaiakalani's 'Learn, Create, Share' pedagogy, each school is able to put their own spin on it to reflect the community they are in. There were plenty of ideas that I will borrow and repurpose in my classroom, like the use of a 'Goal Wall' to make goals visible to learners. Following this, the Manaiakalani Innovative Teacher's shared their inquiries with the insights they gained along the way. I came away feeling inspired to give my own teaching programme a shake up to ensure my lessons are engaging, motivating and using digital technologies as much as possible. Whilst I do believe I use technology a lot in the classroom, these teachers had come up with ideas that I had not thought of before. Check out my infographic to see my main takeaways from the MIT. After morning tea we heard from Rachel Williams about her holiday intervention programmes 'Summer Learning Journey' and 'Winter Learning Journey'. Rachel's aim is to help lesson the 'summer drop off', where learners achievement declines between T4 and T1 after the school holidays. Her results show that students who participated in the 'Summer Learning Journey' had less of a drop compared to students who did not participate in the intervention. Rachel's data was very compelling and I am excited to encourage my learners to participate in 'Summer Learning Journey 2.0'. Next Woolf Fisher researchers, Rebecca Jesson, Stuart McNaughton and Aaron Wilson shared their insights gathered from observing teachers, and challenged us to consider what we are doing to accelerate our learners achievement. Dorothy, Russell and Pat Snedden spoke about where we are now and where to next for Manaiakalani. Although we are doing a great job accelerating our student's achievement, we need to continue to reflect, refine and improve our teaching. We have a series of outreach clusters which are looking at us and using what we are doing to accelerate their learners achievement too. Therefore, we need to be at the forefront of change and be constantly seeking ways to help our learners achieve. Pat Snedden's talk was the most inspiring of the day. He is so passionate about lifting our learners out of subsistence to capital builders. I think Pat Snedden gave me the kick I needed to ensure that I am constantly doing my best and seeking ways to improve my teaching, because it is what my learners deserve. I also used Twitter when I heard something which resonated with me. Here is a collation of my tweets from the Hui. I love your infographic! You really captured some of the main ideas, these resonated with me too. You need to teach me how you are inspired to make the infographics, I really struggle - and I like how you've included the thread in your post! What do you think you will do now after the hui? Thanks Georgia! I can teach you! I try to make them look simple but effective, and always think of little symbols to show my ideas! I usually don't use the layouts either I just go with what I think looks good. Thanks, I actually saw that Latai did it so I had a look at Storify too. I think I will definitely take and repurpose a lot of what I saw, specifically the ideas that are on the infographic. I was also re-inspired by Pat Snedden to continue pushing myself as a teacher and coming up with new innovative and engaging ways to teach my learners. I think the Hui was just what I needed to take a look at my own teaching and see how I can do better. What is next for you now? Cool, sounds good! I guess I struggle to identify the key parts of something that others would be interested to read! Awesome! Any idea in particular you want to play with? Blogging for students and the share component of L,C,S! That is true, I just go with the main points that resonated with me. And if you present it in a clear and effective way, people will probably find it interesting too! I think I will definitely use an online timer for writing to push my learners, so maybe a certain time limit per paragraph. I think this will help them keep on track. I also will find ways to use film when doing narrative writing. I would also love to do the goal wall and achieved wall, but I may park that for next year with my own class. That will be great for you to give that a go since it is something that TC doesn't really do. I will be interested to hear whether it makes any changes for your learners! Absolutely, this is very clear and informative. I would say online timer is a great idea to push the learners forward in writing. They would definitely be more focussed. Thank you Sandhya! We used the online timer today for their writing and I think it did make them more focussed because they could see the time was running out. I am keen to have smaller timeframes to complete paragraphs.